"This whole thing was a trap. Without us, there could be no hunt." Other Stars: Ewen Bremner, Colin Salmon, Tommy Flanagan, Joseph Rye, Agathe De La Boulage, Ian Whyte, Tom Woodruff Jr. The Alien and Predator franchises, both owned by 20th Century Fox, seemed like an inevitable subject for a crossover. The theme had first been developed in a comic book series from Dark Horse Comics, and had been broadly hinted at in Predator 2 when an Alien skull was briefly glimpsed in the Predator's trophy case. For a variety of reasons, however, the ultimate combat demanded by fanboys everywhere wasn't forthcoming for many years as the producers sought a suitable script and squabbled among themselves. Paul W.S. Anderson (Resident Evil), an admitted fanboy himself, finally was able to break the logjam, and the result is this picture that offers plenty of slime and monster action. In October 2004, the Weyland Corporation's satellites observe a thermal bloom in Antarctica that leads to the discovery of an ancient pyramid 2000 feet below the ice. Tycoon Charles Bishop Weyland (Lance Henriksen) organizes a team of various specialties, including archaeologist Sebastian de Rosa (Italian film star Raoul Bova), chemical engineer Graeme Miller (Ewen Bremner) and guide Alexa Woods (Sanaa Lathan), among others. But on reaching the site, they find a hole already drilled down to the pyramid, beginning at the spot of a whaling camp mysteriously devastated a century earlier. Exploring the pyramid, the team accidentally releases a captive alien queen. Before long, they find themselves caught in the middle of a mortal combat between a team of Predators and the Aliens, with themselves as hosts for the Aliens, trying to find a way to survive and to stop the spread of the Aliens across the globe. Although critically reviled, this is a picture by fans of the franchises, for fans of the franchises. Anderson doesn't disappoint in this respect, borrowing the aspects of the earlier films that worked well and generally being careful not to contradict the established mythologies of the respective series (though there inexplicably end up being quite a few more Aliens than there were hosts, making one wonder where these extras came from). There are plenty of subtle nods to the earlier films that will be enjoyed by those in the know but can be safely ignored by those who aren't. Anderson's Aliens are suitably vicious, and he makes much better use of the spearlike tails of the creatures than his predecessors did, having them constantly stabbing and whipping in a ferociously aggressive manner. We learn a little bit more about the Predators and their ritualistic hunt culture, though in certain respects they also remain enigmatic. That's a bit problematic, because it's hard to get too involved in the combat between the two species until fairly late in the film, when Alexa wins the respect of Scar (Ian Whyte), one of the Predator team, and joins in the fight with a makeshift weapon and bit of armor that's entertaining. This motif of identification is one borrowed from the comics, but it's really necessary to increase audience involvement. Anderson does overuse one particular shot, of the Alien's inner jaws extending towards its victims but not quite reaching them; half as many would have been much more effective. The cast is reasonably good for this kind of picture. Henriksen provides continuity with the Alien films, with his Weyland acting as the template for the Bishop androids that appear in those films not only physically but in character traits. Lathan is a decent replacement for Sigourney Weaver, who wouldn't fit into the timeline of this picture, assuming the role of the woman who knows better than the men, who charge in imprudently. Bova is very good, though he's given some lousy dialogue to spout that doesn't quite work, especially when he is instantly translating ancient hieroglyphics. But what the fans really want was the combat between the monsters, and although the first incident doesn't happen until halfway through the film (similar to Ridley Scott's original Alien, which also starts slowly), after that it's a wild thrill ride. Anderson surprisingly, for this era of CGI at all times, uses plenty of practical effects to give the creatures a nice reality. There's a ton of slime and alien blood; I have to say this is the first time I've seen an MPAA rating of PG-13 for "Slime." This picture doesn't really deserve its bad reputation as a video game on film. It's high concept, but the execution is about as good as one can expect. Quite a lot of knowledge is assumed of the audience (especially about the Aliens' life cycle), so it may be puzzling for those not familiar with at least the first two pictures in each series. There's also an extended cut that runs 1m:22s longer, with a bit more slime and gore, but both version have an amazing 11 and a half minutes of end credits that really cuts into the actual running time. The credits are attractive, however, and the effects commentary reveals that the text is actually written in the Predator alphabet before it morphs into English. Now, that's a fanboy move, if there ever was one. The recommendation is for the fanboys (and girls). Image Transfer Review: The anamorphic widescreen picture looks very nice indeed, as one would expect for a recent major action release like this one. The picture is quite dark, with lots of shadow detail, though on occasion bright primary colors take over. I didn't observe any edge enhancement, and crispness and detail are quite good, allowing one good opportunity to examine the amazing production design. The source print is appropriately immaculate. Audio Transfer Review: Both DTS and DD 5.1 tracks are provided, and as expected they have a fierce immediacy that adds impact to the picture. There's a ton of booming bass when the Predator guns are used. The surround effects are very effective, with the skittering sound of Aliens and others moving from speaker to speaker. The audio is not remotely switchable, however, requiring a trip back to the menu in order to compare the tracks. 2 Feature/Episode commentaries by 1) Paul W.S. Anderson, Lance Henriksen and Sanaa Latham 2) visual effects supervisor John Bruno and creature effects designers Alec Gillis and Tom Woodruff Jr.
Extras Review: Unsurprisingly, this film is loaded up with extras. A pair of commentaries discuss the picture. The first, with the main stars and Anderson is disappointing and useful mainly for Anderson pointing out the references to the earlier films and briefly touching on the troubled history of the project. The stars mostly just go wow over how the film looks; at one point Henriksen answers his cellphone and talks to his daughter. Much more satisfying is the commentary by the effects crew, which points out the practical effects used and how the many quite astonishing shots were accomplished. They're rightfully proud of their work and it shows. If you only have time for one commentary on this picture, this is the one to hear. Three brief deleted scenes don't amount to much, although there is a bit of sense of humor displayed by Scar at one point as he goofs with an Alien corpse to frighten Alexa. A 23m:13s "making of" is a pre-release bit of studio fluff though there are some interesting tidbits that make it worth watching and it doesn't have the fawning character that these things usually display. 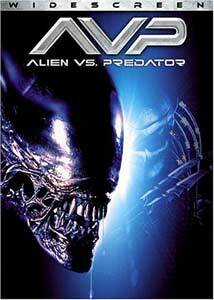 The DVD-ROM extras supposedly include comics material and a preview of the AVP graphic novel. The review copy I had attempted to install HotLlama software but failed to do so, claiming it was a corrupt installation file, with the result the DVD-ROM content remained inaccessible. It's a pretty good package in all, but where are the trailers? A point is docked for the space taken up by promos for unrelated Fox television shows and DVDs. A fun film for fans of the two series, with a first-class transfer and plenty of extras. As fairly mindless sci-fi action goes, it's very well done.